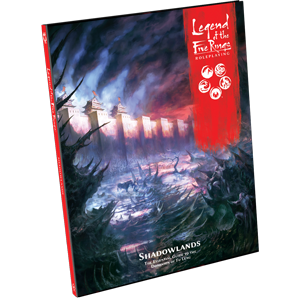 Explore Fu Leng�s festering domain with the Shadowlands Sourcebook for the Legend of the Five Rings Roleplaying Game! Discover the vile locations and denizens of this ancient realm, as well as the brave samurai who stand against them, including the mighty Falcon Clan. Finally, advice for Game Masters running campaigns in this dark domain ensures your games are dripping with theme. Can your samurai survive the perils of the Shadowlands?